“I invented this for my mother. I wanted her to shower comfortably,” says Ma Yanjun, a Chinese farmer. The bottles are connected to each other by a plastic tubing so that water flows through them. Sunlight heats the water as is passes slowly through the bottles before flowing into the bathroom as hot water. He apparently gets enough water for 4 of his family members. 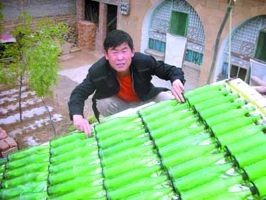 His invention is such a success that some of his neighbors replicated it.